This composite part consist of BBa_K731300 part (lacI-lacIq) and a tac promoter followed by a lac operator in the forward direction. It is a ready to use composite part and it allows the expression of a gene of interest with a strong E.coli promoter and under the control of IPTG. The lac operator decreases basal levels of expression. This part is an improvement of BBa_K314111. LacI gene product is a trascriptional inhibitor inactivated by allolactose, a lactose metabolite. In its active conformation (no allolactose bound) it recognizes and binds lac operator sterically preventing the RNA polymerase binding to the tac promoter and owering constitutive gene expression. In its active conformation (allolactose bound) it releases lac operon, allowing polymerase recognition of Ptac. 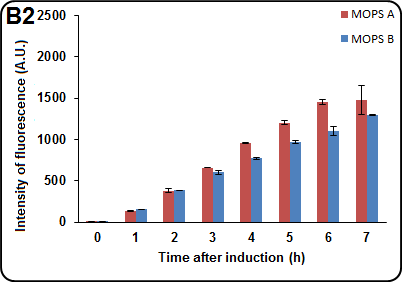 Protein expression can be induced with isopropyl β-D-1-thiogalactopyranoside (IPTG, an allolactose analogous). This part allows IPTG-induced gene expression. lac operon and Ptac activity has been measured by placing a GFPmut3b under control of this regolative part and assaying protein level by fluorescence. See BBa_K731520 for sequence details. This part has been characterized in both pSB4K5 and pSB1C3. FIGURE 1 Dependence on protein expression of IPTG concentration. NEB10b cells transformed with BBa_K731520 both in low copy (pSB4K5) and high copy (pSB1C3) vectors. 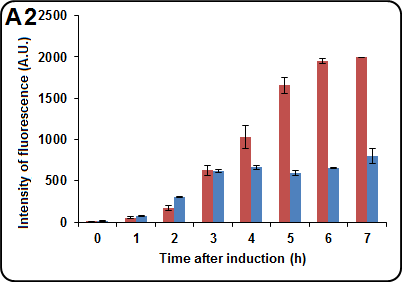 Cells were grown in LB at 37°C until OD of 0.6 and induced with different concentrations of IPTG. After 4 hours a 1.5 mL aliquot was taken from each sample. Cells were spun down and resuspended in 1.5 mL of PBS. Fluorescence measurements were taken with a Varian Cary Eclipse Spectrophotometer using an excitation wavelenght of 464 nm. 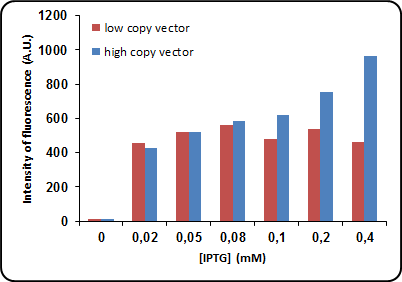 While in low copy vectors maximum protein expression is reached at low IPTG concentration such 0.05mM, high copy vectors show protein expression linearly proportional to strength of induction. This may be due the fact that lower IPTG concentrations are sufficient to trascriptionally activate all plasmid copies when plasmid concentration is small (i.e. when a low-copy vector such as pSB4K5 is used). 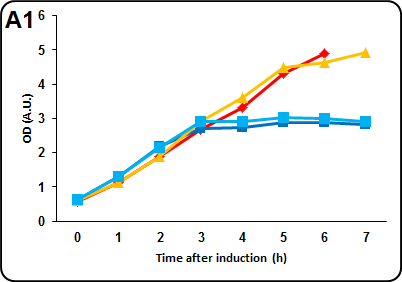 FIGURE 2 Effects of carbon source and induction on protein expression levels. Cells were grown at 37°C in LB until it was reached an OD of 0.4. The cells were at this point spun down and resuspended in an equal volume of MOPS medium and allowed to grow to an OD of 0.6. Prior induction the cells were splitted into two samples of equal volume and one of the two sample was induced with 0.1 mM IPTG. Every hour a 1.5 mL aliquot was taken to measure optical density, pelleted and stored overnight at 4°C. The following day samples were resuspended in 1.5 mL of PBS to measure fluorescence. In case of instrument saturation (A.U. > 1000) the volume of PBS was doubled. 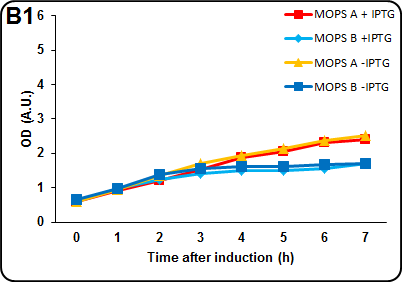 The assay was performed in two different MOPS media. MOPS A: 60 mM glycerol ("hot" colours). MOPS B: 30 mM glucose ("cold" colors). The experiment has been performed in triplicate. Panel A1& A2: Optical density at 600nm and intensity of fluorescence in pSB4K5. Please note that last MOPS A peak in this panel is not significative, since the instrument was saturated even at 1:2 diluition. Panel B1 & B2: Optical density at 600nm and intensity of fluorescence in pSB1C3. Fluorescence measurements were taken with a Varian Cary Eclipse Spectrophotometer using an excitation wavelenght of 464 nm. We observed better cell growth and protein expression when NEB10b cells were transformed with the low copy vector. We also noted a difference in cell growth and protein expression depending on carbon source, with glycerol-containing media allowing better growth. No fitness decrease has been observed when cells were induced with IPTG 0.1 mM. Difference in protein expression may be due inductor exlusion, which occurs when glucose may be used as a carbon source instead of lactose. This is more evident in low copy-transformed NEB10b.